There are some memories from childhood that never fade. One such memory that left me deeply influenced was a lesson in primary school. The title was something related to ‘Ahimsa’ (non- violence), but the picture in that lesson is still fresh in my mind. It was Mahatma Buddha walking along with a herd of sheep and a shepherd, carrying a lamb. The story goes that as Buddha was walking, he saw that the shepherd was beating a lame lamb as it could not walk as fast as the other sheep. Out of compassion, he picked up the lamb and started walking with it. The lesson was that we have to show compassion to every living being. It seemed such a noble idea to my young mind and I was in awe of Buddha. Years later when we visited the Buddhist NamdrolingMonastery, also known as the Golden Temple in Kushal nagar, I was shocked to see that Lamas ate non-vegetarian food. When we asked for momos in the canteen, they asked, ‘Vegetarian or non-vegetarian’? 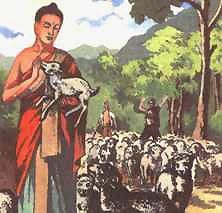 Where was the non-violence that Buddha talked about and killing animals for food? I was very disturbed by these contrasting views. I found out that if an animal dies of natural causes, Buddhism permits eating its flesh. But looking at the amount of meat being consumed, is it possible that such a large number of animals are dying daily of natural causes? In Vietnam, a country with a significant Buddhist population, it was very difficult to get vegetarian food for us. Every meal, right from breakfast, included lots of meat for the local population. My husband got so paranoid that he used to get his dishes made in front of him, by pointing out the vegetarian ingredients to be added in the dish. In 1972, the fourth King of Bhutan announced that Gross National Happiness was more important than Gross Domestic Product. In this paper, the basic conceptual features of Mahayana Buddhism are discussed particularly as they relate to the Mahayana Buddhist view of happiness. The primary purpose of Mahayana Buddhism is to spread happiness and compassion to everyone in the world. As this paper shows, the goal of modern Gross National Happiness is also based on Mahayana Buddhist principles to increase happiness for everyone. But when we look at the Bhutan food, Bhutanese cuisine is influenced by Chinese, Tibetan and Indian culture. Their main dish generally includes white or red rice, seasonal vegetables, and meat often cooked with chili or cheese. Pork, beef and chicken are eaten regularly. I was so confused with these conflicting situations that I did some research. Buddhism was founded in about 500 BCE by Prince Siddhartha Gautama. He was a fully trained and certified warrior and scheduled to become king, but instead escaped from the palace by night and wandered about India as a mendicant trying various methods to achieve enlightenment. He finally succeeded while meditating under a Bodhi tree (Sacred Fig Tree Ficus religiosa), and from that time on was known as Gautama Buddha. The Buddha spent the rest of his life teaching the dharma (the underlying order of life, nature and the cosmos). Upon his death at 80 his well briefed disciples continued the teaching and Buddhism became a major influence on the Indian subcontinent and beyond. The major branches of Buddhism are Theravada, Mahayana, and Vajrayana. · No killing of any sentient being (similar to Jainism) nor using animal products (milk, eggs, leather, feathers, etc. - similar to vegan). Oddly, the cuisines of all the predominantly Buddhist populations feature meat. · Alcohol and other intoxicants are forbidden because they may result in violations of others of the "Five Moral Precepts": no killing, stealing, sexual misconduct, lying or partaking of intoxicants. Also intoxicants cloud the mind and interfere with the concentration needed to achieve enlightenment. · Onions, Garlic, Scallions, Chives and Leeks, "the five pungent spices" are forbidden for some sects (China, Vietnam) for pretty much the same reason as in Hinduism, they're said to lead to anger (raw) and passion (cooked), but the Buddhists add that their odors repel Gods and attract hungry ghosts and demons. Given the rules stated above, it may seem strange that the world's Buddhist populations are predominantly meat eaters. Strict adherence to vegetarianism is the rule for priests, monks, nuns and those who feel they are on the Bodhisattva path - except in some schools and sects. The Buddha himself is reported to have died from eating tainted pork. Some apologists say it was mushrooms but pork is well documented. It is said the Buddha sometimes ate meat that was prepared specifically for him in violation of the exception rule. This is said to be to demonstrate freedom from attachment - even attachment to the rules of Buddhism. Being a Keralaite, I am a non-vegetarian by birth. Though I turned into predominantly vegetarian, I do enjoy an occasional fish preparation. Still I can’t bring myself to believe that taking another life for enjoyment is not ‘himsa’.